Belinfante was born in the Amsterdam neighborhood Watergraafsmeer on March 6, 1893, the third child in a family of ten. From his father Aron, a diamond worker, and his uncle Sidney, Daniel got his first violin lessons. He studied piano with Ary Belinfante, his great uncle, the director of a music school in the center of Amsterdam. 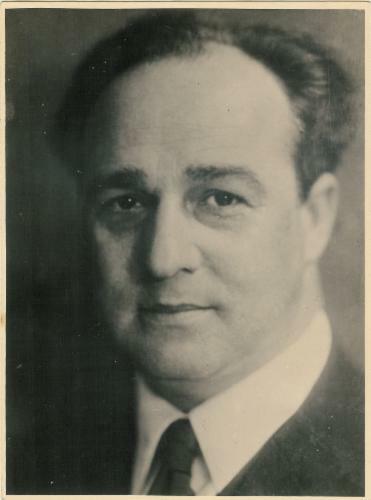 In 1915, Daniel continued the family tradition, becoming director of a music school in the Watergraafsmeer, where he also taught piano and composition. The building on the corner of the Hogeweg and Pythagorasstraat is no longer reminiscent of the former music school. In 1923, Belinfante married his student Martha Dekker and together they continued running the music school. In addition to classical music lessons – primarily given by musicians from the Concertgebouw Orchestra – they also launched a jazz curriculum, for both amateur and advanced music students. Already in 1934, long before jazz was introduced at Dutch conservatories, they established the Eerste Hollandsche Jazzklasse (First Dutch Jazz College). Lessons were offered in jazz piano, trumpet, double bass trombone, sousaphone, tuba, banjo, mandolin, clarinet, flute, saxophone and percussion. Daniel Belinfante composed a Concertino for piano and orchestra for his students. This piece was broadcasted with two eight-year-old soloists and the vara Radio Orchestra on June 2, 1937. A caption underneath a photograph of Belinfante as conductor reads: “Performance by the school orchestra during the second movement of the piano concertino under the direction of the composer in the Recital Hall – Amsterdam Concertgebouw.” Little is known about other concerts of Belinfante's work; most likely, performances took place in the private domain. Belinfante may have been too insecure about his music to expose it to a wider public. On the other hand, one can imagine that a composer needs feedback for defining his or her position in the field of music, and if necessary make musical adjustments. During the time in hiding (4 J. grandparents!) Daniel nevertheless provided food, documents and money for other refugees. He had a strong feeling for justice and humanism and took care that, where appropriate, support was given. As a “Mr. Hafkamp,” he rented an uninhabitable home on Zandhoek 5, and as a “Mr. Mulder” he applied for utilities. During his daily delivery of British radio messages for the resistance movement, he was caught in the act and not wearing the yellow star and this meant off to the P (=Prison) camp. At first the violent infringement on his liberty left him broken, numb. Until a sudden vitality prevailed – he asked me for some writing paper. Then, on the top bunkbed, he wrote a composition depicting, as he said, the sorrow of that moment and his environment. It will be emotionally upsetting when it is one day performed. First in the orchestra, later forced to work in the mines. Although blessed with a very strong constitution, due to malnutrition and mistreatment he fell ill. Was hospitalized – with the approach of the Russians, the German Wehrmacht set the infirmary on fire. According to eyewitnesses, Jews were not allowed to leave. After the war, Martha found their Amsterdam home ransacked, but their musical legacy was intact. Unfortunately the archives of the Watergraafsmeer Music school and all personal documents stored elsewhere, were either lost or confiscated by the Germans. Martha didn't hear about Daniel's death until six months later, in July 1945. By then, the music school had reopened and she took over the management. The opening concert featured Händel, Ravel and Debussy, but surprisingly no music by Daniel Belinfante, even though the school was already renamed the Dan. Belinfante Music School. In this way the founder of the school was honored, but performance of his work was apparently still too sensitive. It was not until the 1990s that the time was right to play and record his music. Although the personal documents were lost, the essential legacy, his music, was fortunately salvaged. In 1955, Martha Belinfante-Dekker donated his music to the Municipal Museum in The Hague and finally the scores ended up in the Dutch Music Institute. The majority are manuscripts, except for the printed edition of the Concertino for piano, flute, oboe, violin, viola, cello and double bass. In May 2004, Francesco Lotoro, an Italian pianist working on a project about music created during World War II in the concentration camps, asked his Dutch colleague, Marcel Worms for information on Belinfante. This touched a chord by Worms whose curiosity was aroused, and he asked the Dutch Music Institute for the scores. At the end of that year a group of eager musicians examined most of Belinfante's music. On May 4, 2005, they performed some pieces at the annual memorial concert in Amsterdam in the large hall of the Beurs van Berlage. These works had not been heard for some sixty years. Gradually, Belinfante's musical language was revealed. Like his Dutch contemporaries, his music had a strong affinity with French music from the interbellum; with influences of Ravel and Debussy and especially of Darius Milhaud. Like Milhaud, Belinfante frequently uses bitonality and polytonality, the usage of two or more keys simultaneously. This provides his work with harmonic tension and a rich array of colors. A certain reluctance in the tone and ostinato rhythms refer to the aesthetics of the Parisian Groupe des Six, of which Milhaud was a member, and whose neoclassical clarity was paramount to romantic sentiment. Belinfante sometimes composed under the pseudonyms Darius le Beau or Darius Verdonck. These names clearly bear witness to his admiration for Milhaud. Belinfante's piano works – teaching material for his advanced students – reveal his pianistic background and are written with a keen knowledge of the instrument. Outstanding is his Third Sonatine. In 2005, the numerous piano works were completed with the discovery of a number of compositions in possession of Daniel's cousin, Wil Huizinga. She had inherited the scores from Jos Belinfante, to whom these specific works had been dedicated. As a youngster, Wil Huizinga also had studied piano with Belinfante. She remembered him as a kind man who taught in a quiet and calm manner. He refused to wear the Star of David and initially refused to go into hiding. 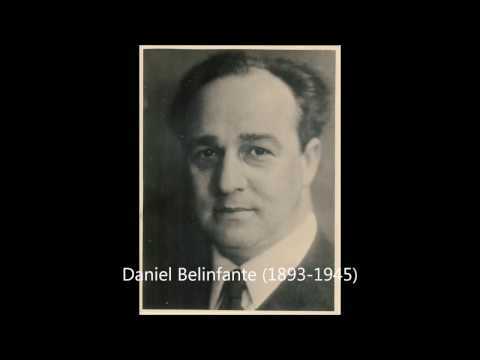 Some of Belinfante's chamber music has been performed in recent years (the orchestral music is not yet published); especially the Concertino (1936) for flute, piano, oboe, violin, viola, cello and double bass impresses with its upbeat and bright quality. The Quartet for two violins, cello and piano (1927) is darker in color and its dramatic power striking. In 2010, the Utrecht String Quartet gave the first performance of the String Quartet no. 1 (1931). The second quartet (1941) and the violin sonatas and sonates for cello and piano are still awaiting their premieres. Some songs performed by soprano Irene Maessen and pianist Marcel Worms in 2005, certainly deserve a reprise. A number of works from Belinfante's extensive oeuvre prove worthy to keep on the repertoire. Thanks to musicologist Wim de Vries, his research findings have been incorporated in this biography.